Carrying small tubs of formula instead of one big pack will help you pack lighter and help you make the baby's feed on a shaky airplane tray. For toddlers, carrying a trail mix of dried nuts, berries, freeze dried fruits in ziplock bags is a good idea. 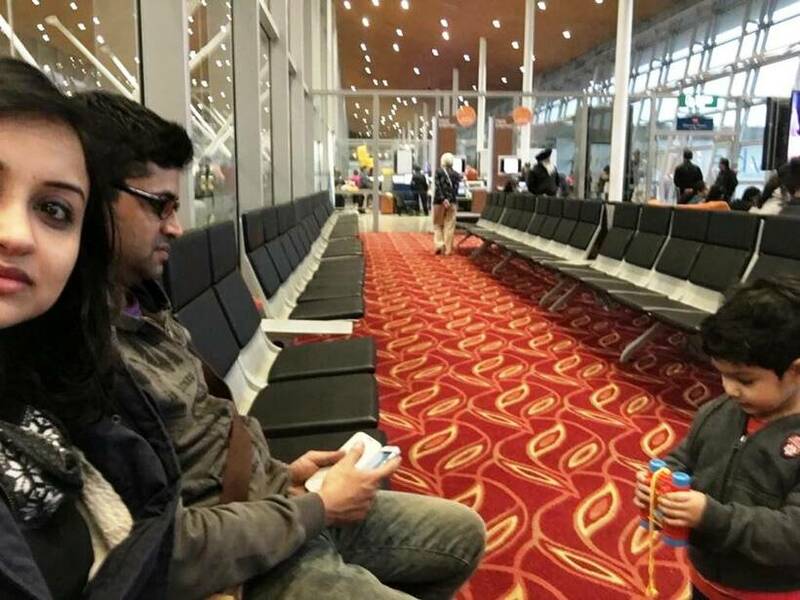 When you are travelling with a kid, you have to take care of the child’s comfort while planning the journey so they don’t give up on you even before the trip begins! This means researching well in advance and finding a flight route that does not have multiple stops with unreasonable transit hours in between. Trust me on this; when you are travelling with a kid, you will have to take care of the child’s comfort while planning the journey so they don’t give up on you even before the trip begins! Imagine walking through multiple airports with cabin baggage and a cranky kid because you got the best deal possible on that budget airline? Well, getting good deals is possible without this added hassle of multiple transit stops. So, think carefully about choosing the right flight route. Why not break the journey into two parts and travel a day or two later to the final destination? When we travelled to Stockholm, we chose a flight via Istanbul, where we chose to stopover for a couple of days before continuing the journey to Scandinavia. This ensured our bub was doing only one stretch at a time and was well rested in between. Take the time to plan the journey well in advance and, if possible, book a flight or a train journey that complements your child’s sleeping schedule. When travelling within India, it is best to avoid very early morning flights so your child is alert and active and is able to walk with you instead of being carried around, thus adding to your carry-on baggage! Most flights within the country are of shorter duration so taking a mid-morning or afternoon flight will suit your kid’s routine the best. When travelling outside of India, check the actual duration of the flight/s and the transit hours in between. If possible, take a night flight so your kid sleeps well and is well rested by the time you land at the transit airport or the final destination. Even if the time zones change, sleeping during the origin country’s timezones on the flight out will leave you well rested even if you land in a country where it’s dark again! Make sure you book a bassinet seat while travelling with an infant on long flights so they can sleep well. You can also choose to carry your car seat along, which you can fix onto the airplane seat and secure your child from any inflight turbulence. Most airlines allow car seats as a part of carry-on luggage exempt from baggage limits, but if you are carrying a baby stroller as well, you may have to pay for one out of the two, depending on the airline you fly with. Once you have reached, you can choose to alter the child’s waking and sleeping routine according to the changed timezone, but expect some erratic behavior and tantrums from the kid when they refuse to go to bed when you want them to. This is because their body clock is still adjusting to the changed timezones and is temporary. Soon, the child will adjust to the changed routine automatically. 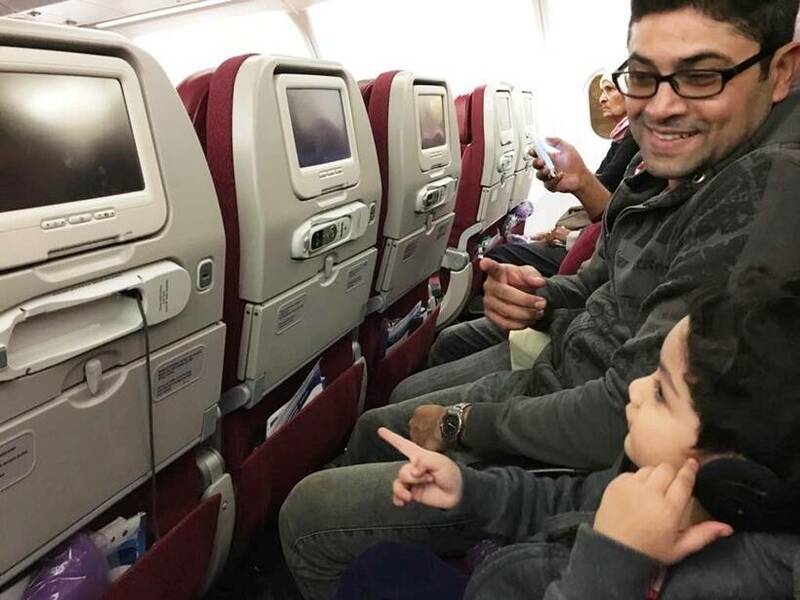 Okay, so you booked the perfect flight, managed to bring your kids and the luggage in one piece and got them seated and belted up. Now is when the actual trip begins, so you will have to get your parenting game on point to start the holiday on a good note. What I have started doing as regular practice now with my little one before she takes a flight or train, is engaging in some pretend play games a day or two before she actually boards the flight. We pretend like she’s at the airport travelling by herself and has luggage to check in, clear security, board the plane, seat herself and secure the straps, and ask for in-flight service from the cabin crew. We go through all these stages like a game and she has a lot of fun pretending to be a passenger travelling on her own. I have noticed the change in her confidence while actually going through these actions at the airport, because she knows what to expect beforehand and now waits patiently at the check-in counters while I check our luggage in and interacts with the staff. For younger kids, I would suggest playing similar games while carrying them along or showing them board books of airplane/bus/train travel, and involving them while packing their luggage so they know they are going to be travelling soon. I have read about a couple of parents who say that they carry along chits of paper and stick them on the seats in front of and behind them that have a note saying they are travelling with a baby or a small child and to expect some noise or seat kicking, but to be patient and understanding as we were all kids at one point in our lives. While I completely appreciate this gesture as a parent of a child that I regularly travel with, I do understand that there may be passengers who are unwell, exhausted, averse to children or are simply looking for an uninterrupted flight to their destination. So parents, do not assume that everything will be in order as kids are unpredictable, but definitely manageable. You may want to carry along play items that the kids will stay busy with for hours, as well as snacks, food and a change of clothes so they remain well-fed and entertained through the journey. Examples of what I carried for my child when she was an infant are noise-free rattles, teether toys, squeezy balls and feeding necklaces. She spent a good amount of time holding onto the different coloured beads in my necklace while feeding and promptly fell asleep. When she was a little older, I started carrying finger puppets and board books for her to play with on the flight. There are several small companies in India that are making great stuff for infants to play with and keep busy such as fabric books with sensory activities like opening buttons, attaching velcros or zipping up and down a section of the book. Please do not carry micro-sized toys that will fall off the seat trays and force you to play crouching tiger hidden dragon between the passengers’ legs. Now that she is able to hold a pen and write, I carry mess-free colouring or skill-set books that she keeps busy with. There are several kids’ educational tablets like the LeapFrog Leap Pad that you can carry along but limiting screen time is at the discretion of the parent. I have played a few augmented reality games with her in a flight, where she suddenly spots a floating dinosaur on top of a passenger’s head and it is quite fun. If you are travelling with a little baby, chances are you will not be feeding them anything more than breast milk or formula (recommended for the first six months). If that is the case, carrying small tubs of formula instead of one big pack will help you pack lighter and help you make their feed on a shaky airplane tray. I was still breastfeeding my infant when we travelled to Europe, and this helped her sleep well and remain calm during the long hours in flight. Remember to burp the baby once they are fed to avoid any reflux due to a shaky ride. Taking a small stroll on the aisle while burping the baby is a good idea so she gets some time to digest her food and also takes in more passenger views. For older babies, carrying a trail mix of dried nuts, berries, freeze dried fruits in ziplock bags is a good idea. Always check the child meal option (if given a choice while booking) for your kid, but do not rely solely on it as we realised when flying to Auckland recently. Ask the cabin crew for meal options for the child, as some International airlines such as Turkish airlines have great kiddie meals with a small toy on board. While I am sure than Indian mothers always carry a ‘dabba’ for their kids with their favourite snacks, remember to keep it light and avoid packing runny curries that may spill onto both you and your child while eating. Use the air sickness bags to throw away any disposables and food waste and carry a sipper for any liquid drinks. Always carry a change of clothes for yourself and the kid. While I have personally taken fewer train journeys in India than flights since she was born, we have definitely taken a lot of road trips across India and abroad. For road journeys, we always stress on putting the child in a car seat compatible with their age. I cannot stress the importance of this enough as most of India doesn’t seem to think car seats are required for children’s safety. If you are travelling by road in First World countries, chances are you will not be allowed to travel without a car seat in place, even if it is a taxi. Asian countries, however, do not have this rule as I have seen kids even travel on their parents’ laps while they are driving! Carry along enough water and fresh juices to keep them hydrated on the way, their favourite music tracks to singalong and some fresh food that you can eat as you stop for breaks. India has a network of highway dhabas that cater to the traveller, with a ‘Haveli’ at every North Indian highway, or a ‘Kamat’ on the Western Expressway. In other countries, you will find designated highway stops with picnic tables and clean toilets that cater to travellers. I usually travel by chair car trains between cities in India or closed coupes where we have more privacy, but I have also travelled with her in train berths with her taking so much space on the berth that I may as well have slept on the floor. Coupled with the safety issues of travelling alone with a baby in Indian trains at night, this made me choose flying as a more convenient and time-saving option. We took a lot of European trains while travelling through countries and also did an entire day’s journey on the Eurail, when we were travelling from Stuttgart to Berlin. It is, however, more comfortable as you have space to keep the baby stroller and luggage, eurail cafes and lounge areas and exclusive family cabins when you are travelling with children. 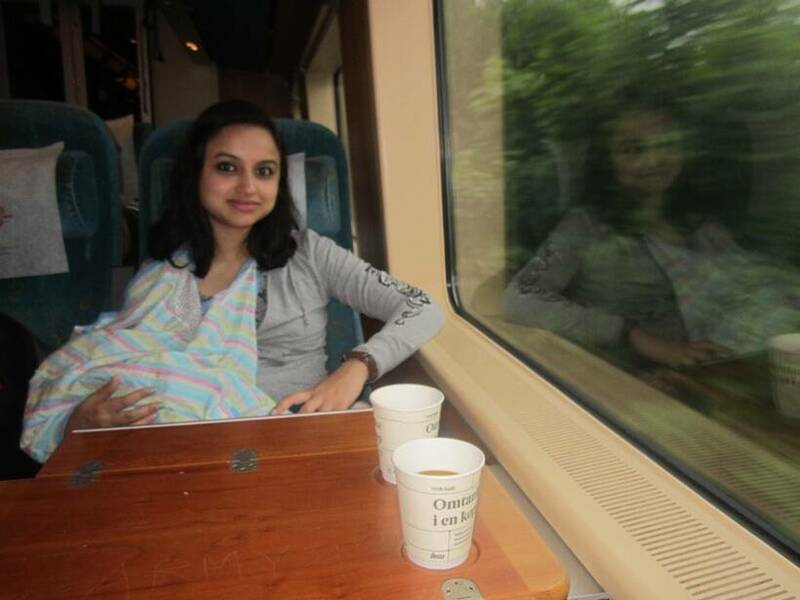 I have travelled across Germany with the baby in European trains and never had a problem. I found accommodating fellow passengers who spoke to the baby in German and made friends with us. I was often helped with carrying the stroller off the train by fellow passengers who saw that I was travelling alone with a baby and promptly offered help. It helped that I learnt some broken German to converse with the locals on the train and they assisted me with the baby when I needed it. Travelling is an experience and more often than not, the journey is what makes it worth the effort. So make the most of your travel plans with your children and explore away!